The first step is to examine what shelving you have available in your laundry room. If there isn’t any, your first step is to put some in. It does not have to be fancy, but it does have to handle baskets of laundry and other items that you will need to corral. Consider installing two shelves above the washer and dryer. If that space is already occupied, you can also use free-standing modular units. Buy three laundry bins and mark them clearly: WHITES, DARKS, LIGHTS. When they are full, you are ready to wash a load of clothes. No muss, no fuss. If someone has particularly funky smelling clothes or items such as gym clothes or workshop overalls, consider having a separate basket or bin that is marked for special treatment. That way the rest of your laundry will not take on that peculiar aroma, and all of the dirty clothes will have a designated spot. Rather than folding clothes on the couch or the kitchen table, use a counter, a foldaway shelf, or even a small table inside the laundry room. That way everything gets folded and handled right. A foldaway shelf will help laundry room organization for those rooms that are limited on space. Have your very own clothes baskets for each family member’s clean laundry. That way, clean clothes don’t effect your laundry room organization and the owner of the clothes can pick the basket up and put the clothes away without having to sort through everyone else’s laundry. This also keeps you from having to fold it all yourself! 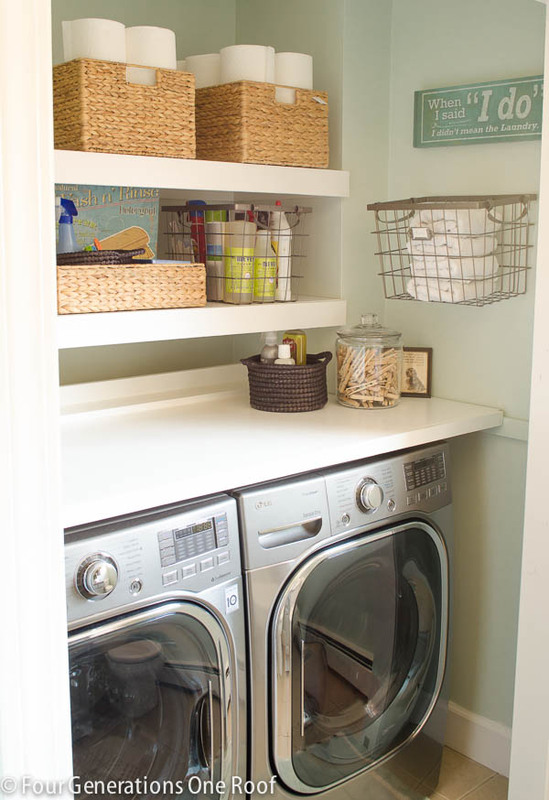 Cleaners can quickly make your laundry room organization into utter chaos. You can put them back in line by putting them in a shoe holder attached to the laundry room door or in a bin for easy reach on your shelves or in your cabinets. When going through the pockets before you wash, you can find many odd things. Have a special jar for loose change and bills, one for odd supplies like pens and paperclips, and a jar for anything else you might find. Keep those jars above the washer and dryer on the shelves so the owners can find them. It’ll keep the loose stuff from getting lost and help with your laundry room organization. No one is sure where the other sock goes, but if you have single socks, put them in a bin or basket so they can be reunited with their other half once you locate the missing sock. This keeps random socks from staying in the dryer, laundry basket, or hanging out on your dresser, which only adds more clutter. If your family is using the laundry room as a mudroom, you can add to your laundry room organization by installing freestanding shelves with cubbyholes that your family can put their shoes, boots, and other items in. It is easier to create a designated place for these items than try to retrain your family to put them elsewhere. If you need plumbing installation, maintenance, or repair services in your laundry room or elsewhere in your home, Leak Geeks Plumbing has the solution for you! Click here to request service online, or simply give us a call today at 817-330-6550.